The vessel Juan Carlos I leaves this Monday from the Rota Naval Base as planned. The fire that occurred in the bow machine this weekend has not affected any important equipment and the flagship of the Navy will be able to continue with the planning for these next days, with some exercises and a visit to the Basque Country. The small fire that was declared last Friday evening was produced, as it was published this way , while some maintenance work was carried out in the bow. The sparks of a radial one fell of continuous way in a cover of refrigeration of the ship, that began to burn. 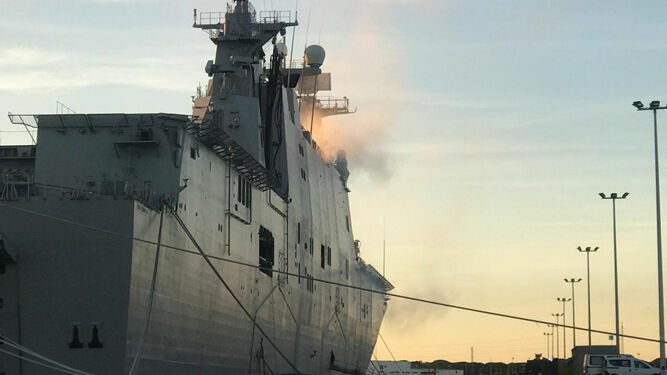 Staff of the ship and firefighters of the fleet squadron began the task of extinguishing the fire that has not affected any important equipment, only a lining of a team, as confirmed by Navy sources, so the ship will depart today to the sea as planned. The Juan Carlos I part thus to the Bay of Biscay, where he will participate in the Sirius exercises and will also be in the Basque Country, in Getxo, where he will have open days.